I’ve been helping to decipher some old gravestones in the newly renovated Mo‘ili‘ili Japanese Cemetery (est. 1908), a candidate for the State and National Register of Historic Places. Here’s a short list of deciphering aids that I’ve just updated in time for this year’s Obon season. Rikai Unicode Kanji Tables are invaluable for locating rare (or miswritten) kanji that don’t show up in the usual kanji dictionaries, name glossaries, or input methods. Kanji dictionaries will often give you the code range of similar kanji (grouped by semantic ‘radicals’), so you can scan for a form that is no longer used in Japanese, but that shows up in old names, then cut and paste it into a search box to see if you can get a name reading. Nanzan University’s 2001 Japanese Journal of Religious Studies (28/3-4) translation of Tamamura Fumio’s “Local Society and the Temple-Parishioner Relationship within the Bakufu’s Governance Structure” helps clarify Buddhist posthumous naming conventions and honorifics. It’s strange to hear a Christian hymn in a Japanese Buddhist temple, being led by the minister, no less. But [Rev. 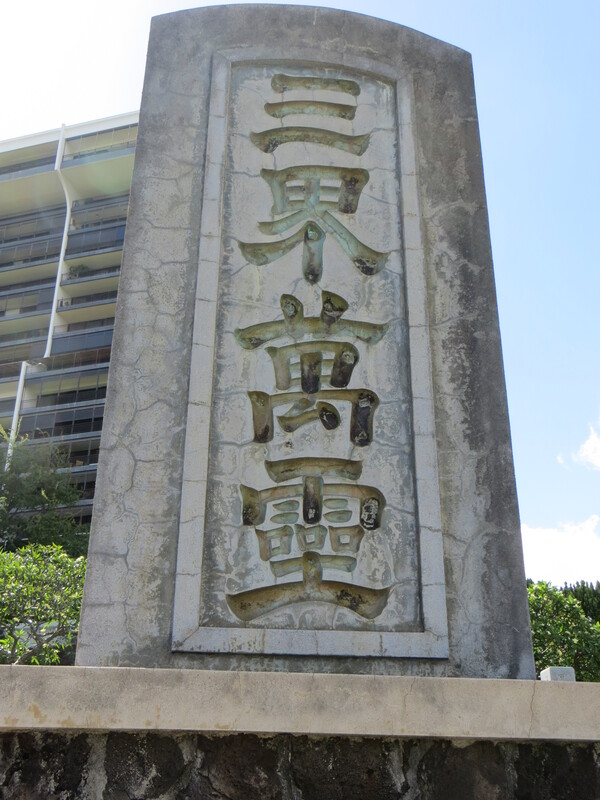 Earl] Ikeda [of Mō‘ili‘ili Hongwanji Mission temple near the University of Hawai‘i at Mānoa] had a reason. “I was invited to do a funeral service recently,” he explains. “I talked with the family and mentioned that it didn’t have to be a strict service done in the Buddhist tradition.” He explained to the family that they could choose a gatha, or song they felt would best honor their loved one. They chose “Amazing Grace.” In fact, adds Ikeda, when it came time to sing, the Buddhist minister himself led the mourners in the Christian hymn. Speaking to us earlier in his modest office upstairs, Ikeda, sporting his usual attire of T-shirts and shorts, says, “I like that song, and the meaning really fits what Buddhism is about. In Buddhism, the idea is to live the moment. We can’t be attached to certain ways of thinking, that’s exactly what Buddhism isn’t.” It was a story he wanted to share with his membership…. There are 33 temples still open on O‘ahu. Visit one of them today and you’ll find a small number of devoted members, all of whom pay annual dues to keep the temples open. It is not uncommon for ministers to speak in front of memberships compromising a dozen members, sometimes fewer. It’s also likely that a temple’s most active members are in their 70s, 80s, sometimes even 90s…. In addition to a shrinking membership, Hawai‘i’s Japanese Buddhist temples are also facing a shortage of ministers. Take [Rev. Jay] Okamoto. For the past six years, he’s not only been the minister of the Waipahu Hongwanji, but also the temples in ‘Ewa and Wai‘anae, neither of which have had their own resident ministers in 30 years. The ‘Ewa temple has 30 members and the Wai‘anae temple has around 50, he says. All Japanese Buddhist ministers must be ordained in Japan before they can work in Hawai‘i and on the Mainland. This often makes it difficult to attract local men and women in the first place, because they have to speak Japanese for their studies. Often, Japanese ministers end up serving in Hawai‘i’s temples, but, says Okamoto, they, too, face linguistic and cultural challenges. It’s a catch-22. There’s also a seasonally related article by David Thompson in the same issue headlined “Bondancersizing the Night Away” (pp. 43-45). UPDATE: The article is about “Bondancercise” classes, a word formed from the merger of Bon + dancer + exercise, but the spelling “Bondancersizing (the Night Away)” implies right-sizing Bon dancers (weight loss). When Thomas Dyer heads to Afghanistan in December, the former Marine and one-time Southern Baptist pastor won’t take a rifle with him. He won’t take a Bible, either. That preparation, he says, will help him bring spiritual care in the midst of a war zone. “We’re going to put it to the test,” Dyer said. Dyer’s deployment is another step in the U.S. military’s attempt to meet the diverse spiritual needs of America’s fighting forces. It’s no easy task. For one thing, the military chaplaincy is facing all the complications that have affected American religion over the past 40 years. The decline of mainline Protestants and their aging clergy. The ongoing Catholic priest shortage. The explosion of religious diversity. The emergence of people with no faith. The ease with which people move from one faith to another. UPDATE: There were Christian chaplains in the Imperial Japanese Army, along with Buddhist and Shinto chaplains. (The pastor of the Hiroshima Baptist Church, where my parents served as missionaries, was a Christian chaplain with the Japanese Army in China.) However, there were no Buddhist or Shinto chaplains in the U.S. Army’s 442nd Regimental Combat Team, only Protestants, even for all the “Buddhaheads” from Hawai‘i.